Communion, or the Lord's Supper, is an ordinance given by Jesus for his followers as a means to obey, remember, and proclaim what he has done for us through his death. This article will help you understand more about why and how we celebrate communion at Constance. Every 4-6 weeks we receive Communion together at Constance. You don't need to be a member of Constance Free Church to take Communion, and anyone who has placed their faith in Christ for salvation is invited. 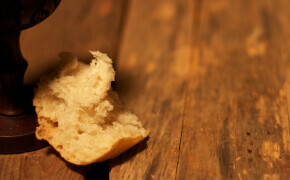 When we celebrate Communion, we do so to obey, remember, and proclaim. Jesus Christ’s sacrifice, an unparalleled act of love, warrants our ongoing consideration and thanks. We must remember Christ’s death, even as we celebrate His resurrection. Ponder the gravity of God’s son, bleeding and broken, giving His final breath to bring life to people far from Him. The bread and juice represent Jesus’ broken body and shed blood sacrificed that our sins might be forgiven. Communion separates “the believer from the world” and gives a “visible designation of those who belong to the body of Christ.” (1) As we take the bread and juice, we proclaim together that it is because of Jesus’ sacrifice that we, sinners, now have the forgiveness of sins. Communion wafer ingredients: Flour mix (garbanzo bean, tapioca, sorghum, fava beans, potato starch), water, canola oil, salt. FREE OF GLUTEN, WHEAT, DAIRY, YEAST, EGGS, SOY, NUTS, & CORN.